In early 2007, this artist was invited by Air Education and Training Commend to visit Columbus AFB, MS, to fly the T-37 one more time before it was retired. My first introduction to the T-37 had been in May 1963 at Webb AFB, TX, resulting in his Air Force Art painting “Solo Student Over the Numbers”. 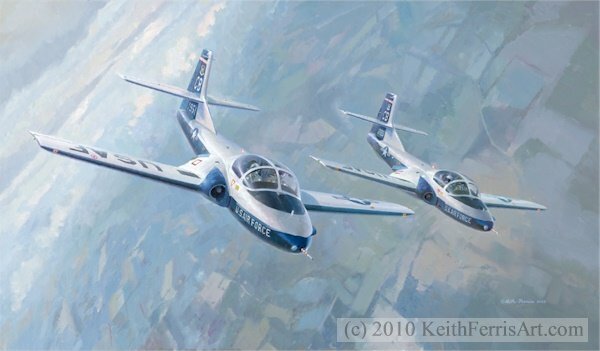 The T-37 fleet had been flying in a high-visibility Keith Ferris designed paint system since May of 1987. For this mission, the artist was plugged in as the "student" in a Student Formation Training sortie. The painting conveys the feeling of hanging on the leader’s wing throughout the whole series of maneuvers required as a “Rite of Passage” necessary to become a pilot in the United States Air Force.